In the CMU SoA, students get their hands dirty from day one, using making as a primary mode of inquiry. Our students may be eloquent idealists, but they also know their way around table saws, 3D printers, and industrial robots. Rather than sitting for five years in a lecture hall, they spend their days working in Pittsburgh neighborhoods and creating in our 3,800 square foot metal and wood shop. 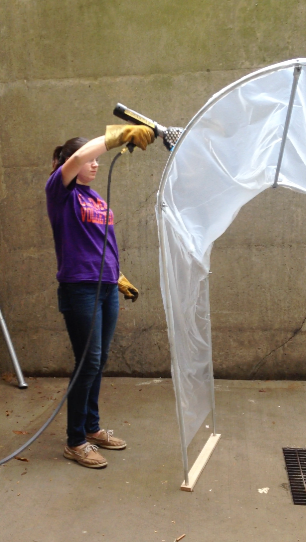 A second-year student heat-shrinks greenhouse plastic with a propane torch. This education is made possible by an urban context and a team of full-time and adjunct faculty who are seasoned practitioners—and many of whom lead Pittsburgh’s top firms. SoA faculty members solve complex architectural problems every day, and share their knowledge and experience with their students in real time. Our students graduate with philosophical and theoretical grounding and with experience taking a project from concept to delivery.